Thomas LaMonte is an AIIM Market Intelligence Analyst well versed and credentialed in the fields of ECM, ERM, and BPM with a heightened focus on solving the operational problems of today’s businesses. What if every file—from documents to multimedia—was digital and used the same file format: “File.everything”— wouldn’t that be nice? But for most workers, the present information environment couldn’t be more different. Today, the typical information ecosystem is a content jungle: multiple file formats, a mix of structured and unstructured content, all growing wildly throughout the organization. Under these conditions, search is difficult; unused operational information atrophies into “dark data,” or the untapped, operational content that sits idle in our repositories. Dark data is at once a security vulnerability, as well as a missed opportunity to leverage information to its fullest potential. Fortunately, today, there is a solution. 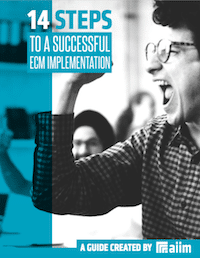 Two big bangs in the information management industry thrilled in Orlando at last month’s AIIM Conference: Gartner’s recent bombshell announcing the “death” of ECM—learn more about a possible successor, Content Services, here. John Mancini’s mic drop reveal that AIIM believes the landscape has expanded beyond “ECM” – to “Intelligent Information Management.” See John's keynote slides here. Chinese New Year is host to many traditions from tasty, meat-packed dumplings to an all hours riot of fireworks. Over its two weeks, the whole country erupts in celebration—it’s a sight to be seen. But above all Spring Festival traditions, I have a clear favorite; maybe you have heard of it before: the gifting of red paper envelopes filled with money. In a year people have nominated as the “worst year ever”—2016’s nonstop change and upheavals are finally behind us. Has this really been the worst year in history? That I’ll leave for the comments to decide, but I do want to bring attention to one 2016 trauma that proves even us—information professionals—cannot escape 2016 unscathed. You’ve heard about content analytics. You’ve been told that your organization needs it. You’ve been told that you need it. But chances are good no one has bothered to explain what it is and why we all should care.